My travel to DC was hardly auspicious. A cancelled flight was replaced by a too-late rescheduled flight later that night (that American would cheerfully change to a reasonable hour the next day for the very unreasonable sum of $525): not a good way to start any trip, especially a two-month residence that is already causing some anxiety in the traveller. But one week in, I have established just enough of a schedule to feel comfortable about being here. 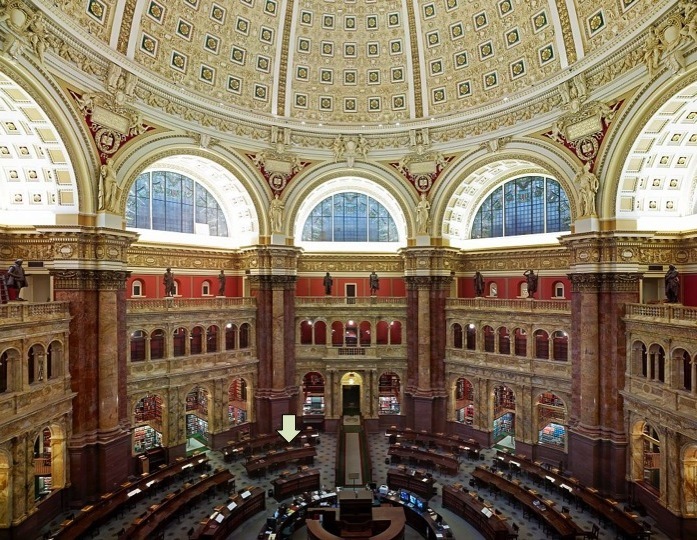 What brought me here are (primarily) collections in the National Archives, Curator of the Architect of the Capitol and the Library of Congress. The main reading room of the Jefferson Building (with my favorite seat noted above) is really the most glorious place to sit with a book (even if it is ridiculously frigid in there). If you can get past the operatic architecture, you’ll see loads of art chronicling great thinkers, profound disciplines, and the whole development of civilization (as considered in 1897, but still) rising up as a great crescendo to the figure in the top of the lantern: Human Understanding lifting a veil from her face. In some respects the majesty and pomp of this city have ceased to work magic on me, but looking up at that thing always leaves an impression. 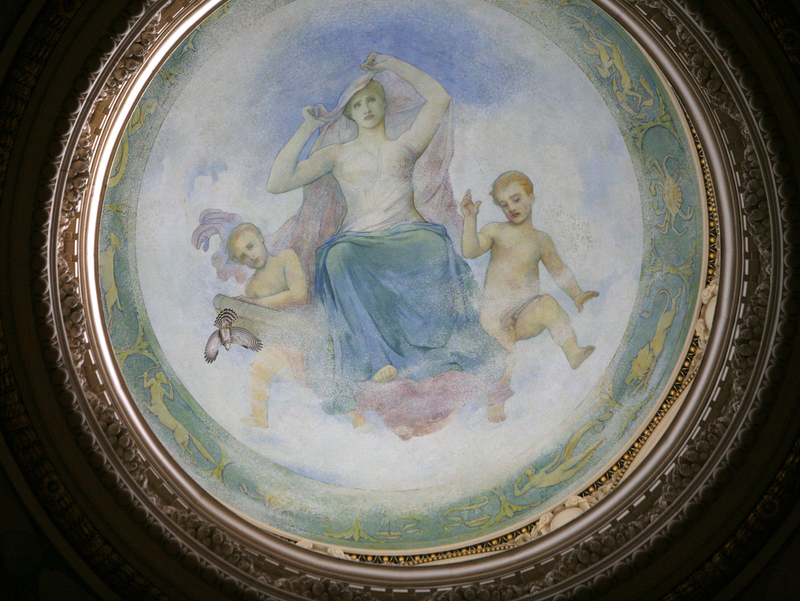 I spend most of my time in that room looking down but when I take a break and look up at that painting at the top of the huge, huge dome, it really does give me chills. Human Understanding, revealed, at the apex of a building that is a three-dimensional hymn to study and the written word, with you as one little piece of the furnishings: If that doesn’t inspire you to knock off checking up on Facebook and get back to reading the nineteenth-century histories and diaries that you travelled 600 miles to read, nothing will. “Sabbaticans:” I like that! Good luck with your work, wherever it takes you!